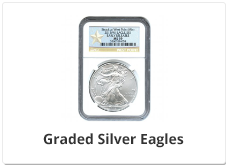 Welcome to BuySilverEagles.com - the complete guide to the #1 most popular silver coin in the United States, the American Silver Eagle. 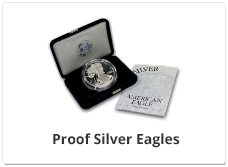 Our website is dedicated to providing you complete information on where to buy silver Eagles, both online and in person, the various types of silver Eagles, and information on each year's release of silver Eagle coins. Scroll down to get started or visit Silver.com now to purchase these coins online. They're pretty - they make great gifts. Obviously their prices vary depending on the year of minting and the quantity purchased, but there are plenty available in the $30 - $50 price range. Easily affordable! They are also available in proof condition at somewhat higher prices. See this website for pricing, as suggested by a coin grading service. They are made of silver, which can be melted down, to realize the highest possible use of the silver when it is greater than the face value attributed to the coin. On the other hand, melting coins may be illegal.Coin melting has a long history. During the 20th century, in the U.S., the Roosevelt Administration (Theodore) banned gold coin melting by citing a provision in the 1917 Trading with the Enemy Act. At the same time 270 million U.S. silver dollars were melted down (1918) in an attempt to stabilize India's currency.More recently, a melting ban was imposed during the 1960s when the price of silver exceeded ($1.2929 per ounce) the face value of pre-1965 U.S. silver dimes and quarters. While attempts to outlaw coin melting have occurred regularly over the years, no governments have figured out how to outlaw Gresham's law (bad money drives out the good money). Consequently, governments just substitute a less valuable metal in its coins and the more valuable metal disappears from circulation. A similar crisis now faces the penny and nickel. In fact, the U.S. Mint "implemented regulations to limit the exportation, melting, or treatment of one-cent (penny) and 5-cent (nickel) U.S. coins, to safeguard against a potential shortage of these coins in circulation." The rule was finalized on April 17, 2007. If enough silver coins are melted down, the remaining coins could become relatively rare and go up in value (acquire numismatic value). Numismatic value arises because collectors value the uniqueness of a particular coin; i.e., its age, design, beauty, pristine condition, number of remaining coins minted, etc., and are willing to pay more than the silver content value for it. While silver eagles are generally considered to be bullion coins, they can have numismatic value as well. Click here and scroll down to find a table of numismatic values for U.S. silver eagles. Please note that their table begins with coins having at least a grade of MS-63. To learn more about grading coins, visit one of the coin grading services' web sites. 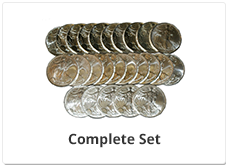 The most widely used services are: Professional Coin Grading Service (PCGS), NGC, and ANACS. They won't become worthless like a stock can. Silver's qualities allow it to be used in numerous ways. If something is useful and scarce, it is an economic good. Economic goods tend towards their cost of production in the long run, while stocks can become worth less than zero if the liabilities of a company exceed its assets. They are recognized as worth something all around the world. They consist of one ounce of pure silver - a recognized and frequently quoted quantity of silver. For the cash market price of an ounce of silver, see below. There is an established market for them - they can be readily bought and sold. 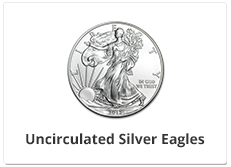 Some dealers who offer silver eagles can be found by clicking here. Silver weighs more per dollar of value than gold or platinum, making it harder to steal than gold or platinum. 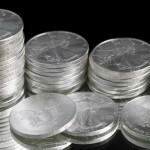 One ounce of silver costs roughly $30.00 to $35.00. An ounce of gold costs roughly $1,600.00 to $1,900.00 per ounce. An ounce of platinum costs roughly $1,400.00 to $1,600.00. In other words, it's alot easier for a thief to walk off with $1,000.00 of gold or platinum than it is to walk off with $1,000.00 of silver. Silver has many industrial uses which keeps the demand relatively high. Silver is used in the manufacture of batteries, bearings, brazing and soldering, catalysts, coins, electrical devices, electronics, electroplating, photography, medical applications, jewelry and silverware, mirrors and coatings, solar energy, and water purification, to name a few. For more information about these uses, see http://www.silverinstitute.org/silver_uses.php. There is a shortage of silver being mined - silver is set to rise substantially in price. See article by Theodore Butler. DISCLAIMER: BuySilverEagles.com does not endorse or recommend the services of Investment Rarities, Inc. (The publisher of Theodore Butler's Article) All links are provided for personal edification only. Some sales of precious metals to dealers may be required to be reported to the IRS on form 1099B. 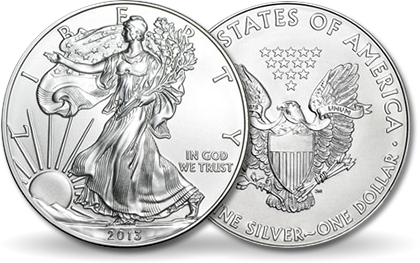 The sale of American silver eagles, however, is not reportable, regardless of the quantity. See about.ag/reporting.htm. Silver eagles are the only silver coins specifically allowed in an IRA. Internal Revenue Code Section 408 (m)(1) requires collectibles purchased by an IRA to be treated as a distribution from such account.Section 408 (m)(2) defines "collectible" to include any stamp or coin.Section 408 (m)(3) provides an exception for certain coins and bullion.Section 408 (m)(3)(A)(ii) allows an exception for the coin described in USC Title 31, Section 5112(e); i.e., the silver eagle. Other coins and bullion may qualify as well under other exceptions to the general rule. See www.bradfordtaxinstitute.com/Endnotes/IRC_Section_408m.pdf.